ABOVE: Le Corbusier's "Modulor" sculpture and the Turkish Villa. Le Corbusier's design for La Villa Turque was influenced by his travels in Turkey, and it made dramatic use of reinforced concrete (which forms the cornices of the house in the picture above). 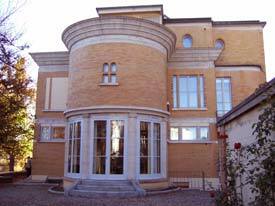 Today, the villa is owned by Ebel, a watch company whose motto is "The Architects of Time." Ebel purchased the house in 1986 and invested heavily in its restoration. La Villa Turque is now used by Ebel's public relations department and includes several guestrooms for employees and important visitors. 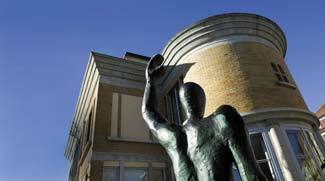 In the past, Ebel has opened the house to visitors on the first and last Saturdays of each month from 11 am. to 4 p.m, with no admission charge. (Unfortunately, that policy has changed, and the building is no longer open to the public. 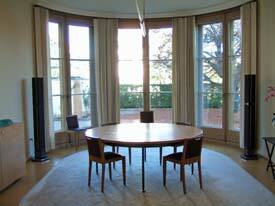 For more information about the architect and the building, read the Villa Turque section of Dale Bechtel's SwissInfo article from 2002, "Reconstructing Le Corbusier's Swiss Legacy." Another good resource is an October, 2018 book titled Le Corbusier: The Built Work, by Richard Pare and Jean-Louis Cohen. The 480-page hardcover is billed as "the most thoroughgoing survey of nearly all of Le Corbusier's extant projects, beautifully photographed and authoritatively detailed." Above: An exterior view of La Villa Turque. 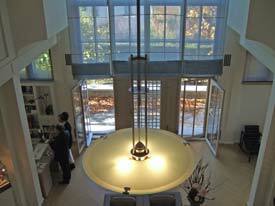 Above: Inside the dining room with its curved windows. Above: The main entrance area, with doors facing the street. Above: An oval window, the view from inside, and a built-in cabinet. 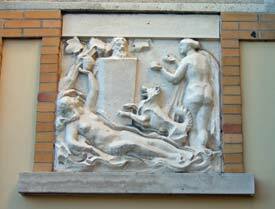 Above: A decorative frieze on the building's exterior. Top photo copyright © Switzerland Tourism. ST/Swiss-image.ch.